Depression and mental health conditions are treatable. TMS Health Solutions can help. We offer comprehensive psychiatry services, including medication management, for people with clinical depression and other mental health conditions. Our team specializes in caring for the 40% of patients who don’t respond to medication and providing innovative and effective therapies for these patients with Treatment-Resistant Depression. We’re proud to be California’s leading provider of Transcranial Magnetic Stimulation (TMS), a highly effective, FDA-cleared, non-invasive therapy for patients who haven’t responded to antidepressants and other treatments. We are an insurance-based psychiatric practice that provides TMS therapy and medication management. Both TMS and medication are covered by most major carriers including Anthem, Blue Shield of California, Cigna, United Healthcare, Optum and more. Our talented team is led by Dr. Richard Bermudes and Dr. Karl Lanocha, two of the nation’s leading experts and educators on the clinical application of TMS therapy for patients with Treatment-Resistant Depression. In fact, the two have written and edited a book on TMS for other mental health clinics across the country to use. 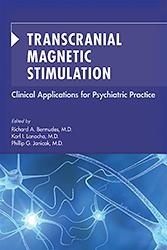 Published by the American Psychiatry Association, “Transcranial Magnetic Stimulation: Clinical Applications for Psychiatric Practices” is the first of it’s kind and shares their collective experience as some of the pioneers in TMS therapy. But don’t just listen to us… TMS has been in the news! We offer comprehensive psychiatry services, including medication management, for people with clinical depression and other mental health conditions. We specialize in providing innovative and effective therapies and caring for those with treatment-resistant clinical depression. Our comfortable, state-of-the art treatment centers are open during hours that accommodate your schedule and are conveniently located throughout Northern California. Our expert clinicians host regular information sessions and seminars on mental health and TMS, as well as accredited symposia and trainings for clinicians from across the country. We also partner with patient advocacy groups to help raise mental health awareness, and provide financial assistance for TMS. Download or share our information packet and get the facts you need to have a productive discussion with your health care provider regarding depression, treatment options, and your next steps. Schedule a consultation with a clinician at one of our convenient locations. Contact us and our Patient Access Team will contact you within one business day to review your options and schedule an appointment.